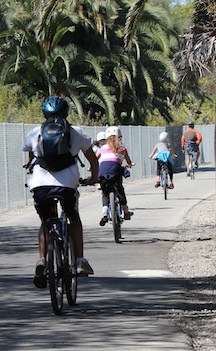 The bike trail that I use for many of my morning walks is paved with asphalt, and sits atop an old railroad right of way that runs from near the beach all the way to Ojai, almost 30 miles to the north. The surface beside the paved bike path sometimes resembles beach sand. 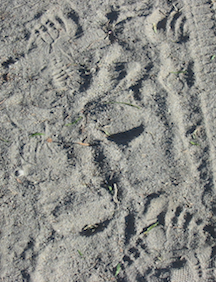 These areas record layer upon layer of footprints going in both directions along the path. These footprints will be swept away by wind and rain periodically, then be replaced later by those who pass this way. Such is the fate of the footprints we make in the sands of time during our brief journey from null to void. This entry was posted in Miscellaneous Musings and tagged palimpsest, walking, walking path. Bookmark the permalink.